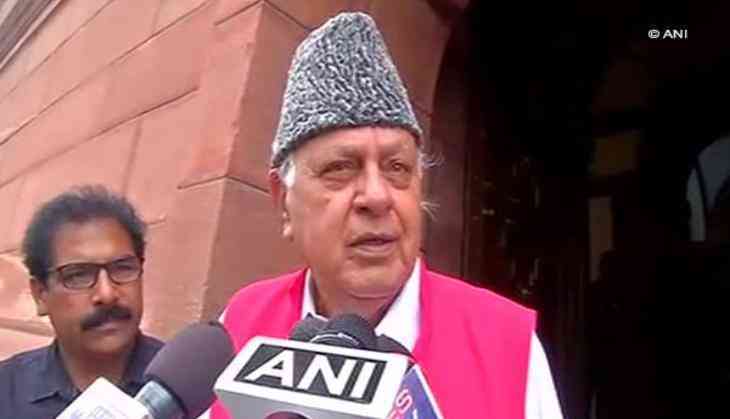 Jammu and Kashmir National Conference Patron Farooq Abdullah has congratulated the security forces for killing Lashkar-e-Taiba (LeT) chief commander Abu Dujana in Jammu and Kashmir's Pulwawa district on 1 August. "I hope the security forces continue to do such good work, so that there is peace and calm in the state," Abdullah said. In a major breakthrough, Dujana of Pakistan along with his accomplice were killed in an encounter with security forces at Hakripora village in Pulwawa district. Confirming the news, the Jammu and Kashmir Police Twitter handle said, "LET chief commander Abu Dujana of Pakistan along with his accomplice killed in Hakripora Pulwama. Huge achievement for police & SF (sic)." Earlier, the security personnel who killed Dujana came under heavy stone pelting from locals after various news channels reported that Dujana had been eliminated in the encounter. On July 19, Dujana and two of his associates gave the slip to security forces in Pulwama district. According to media reports, the trio exchanged fire with the armed forces and managed to flee from the spot. Dujana was one of the most wanted terrorists and carried over Rs. 15 lakh bounty on his head. Earlier in July, Indian Army released a list of 12 most-wanted terrorists operating in the Kashmir Valley and Dujana was in that list. The Indian Army has managed to kill more than 95 terrorists in the Valley in 2017, including some top level commanders, but Dujana is one militant that has managed to flee on multiple occasions.